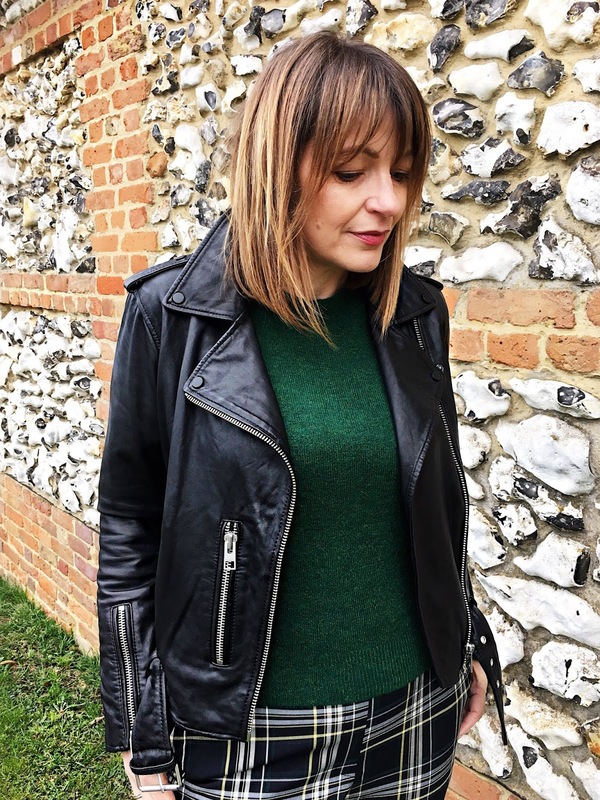 This time last year I wrote all about a lovely faux leather biker jacket I picked up from H&M for £35! Yes, it was an absolute bargain, and a great way for me to test what I really wanted from a biker jacket. I had spent a lot of time looking at biker jackets, but had more questions than answers – Did I really need to buy leather? Why did the price-point of £75-£100 have such a confusing mix of premium faux leather and poor quality real leather? How best to spend your hard earned cash when it was really hard to tell the difference between good value for money or a cheap quality rip off for a hefty price tag! So I reluctantly went against my normal principles of buying cheap on an investment piece, but I made the right decision. The H&M jacket taught me, that faux leather will not keep you warm. I found I had to layer up considerably to stay warm if I wanted to use it as much as possible all-year round. Now proven because since I’ve invested in my gorgeous Allsaints iconic Balfern design biker jacket it’s one of many features I am loving about this new leather jacket. 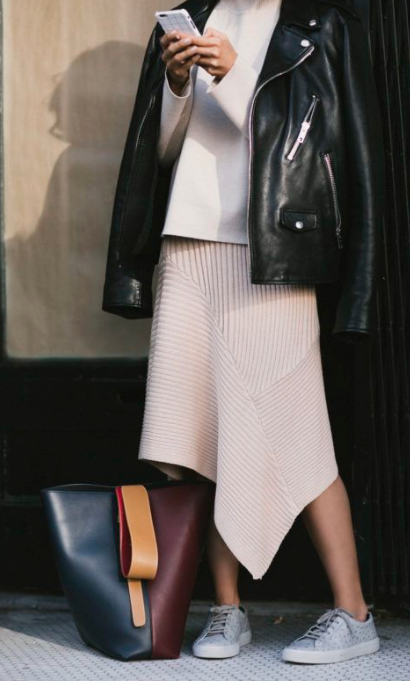 WHY BUY A LEATHER BIKER JACKET? 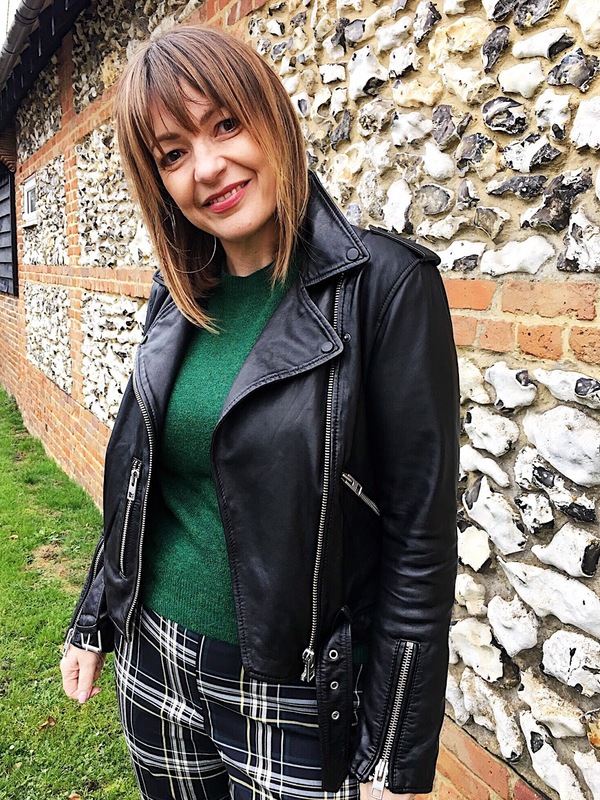 A biker jacket is such a great staple to have in your wardrobe, I have found (possibly due to our warmer winter) that I have worn mine so much. It’s a great transitional item that adds a lot more edge than simply adding a coatigan or a blazer. I love to wear mine most with dresses and skirts – either with with boots or with trainers. HOW MUCH SHOULD I PAY FOR A LEATHER JACKET? A question that I now feel quite confident in answering. To get a really good leather jacket, in terms of quality of skin, design, fit and style I would say over £300. Anything below that I feel you could be doing yourself a disservice and possibly be better off spending no more than £50. So go high or stay low is my motto for this. Now that’s not to say you have to pay full price. I didn’t. Learn to wait until the right time. Once I made my decision that I wanted to upgrade, I waited until Black Friday back in November, and if it had not been at the right price for me, I would have waited again until the January sales. Then if it’s not quite where you want it to be, you need to ask yourself are you being realistic? Good brands to consider are Belstaff, Coach, Allsaints (of course), Reiss and Massimo Dutti and &Other Stories. If you are staying low, again wait for the sales if you can and then get the best you can from Mango, Topshop or Oasis. Yes Oasis, I’ve seen some great styles from this brand. Don’t save it for best, get wearing it! And finally…. just enjoy wearing it!